We always look forward to Fridays, not just cause fashion Weekly drops, but the end of the week begins, which means outtings with friends. So I’ve created two looks a Men and Women that will have you prepared for the weekend. Monica! Monica makes black look more than just simple, the way the color compliments her is very amazing. This look is great for the club nights and bar hops with her crew. Monica features a crew neck lace up crop top, knee rip skinny jeans, ankle strap heels, a fuzzy leather tote, and silver accessories. Malik! Malik is a very fashion savvy guy, he’s always willing to go outside of the square, with all confidence. Malik’s look is perfect for the night out with his boys. 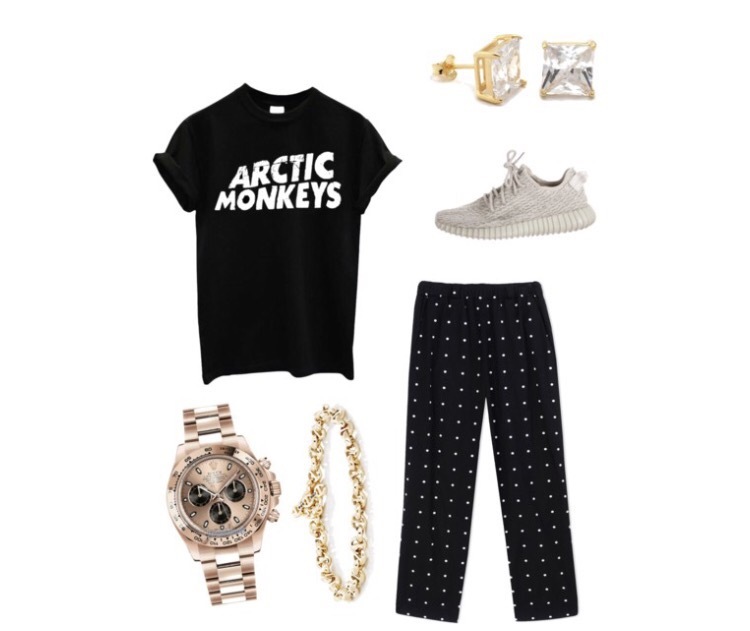 Malik features a graphic fitted tee, spotted trousers, tan yezzy sneakers, with gold accessories.